Business agility is the ability to be constantly focused on customer value whilst smoothly, rapidly and safely adapting to changes and anticipated changes in the external environment. Value makes sense only in the context of an organisation and its customers. Business analysts need a profound understanding of both. These differentiators help to answer the question, “Why choose us?”. They are the basis of the organisation’s business model are are central to rationalising the organisation’s concept of value. Knowing the answer to the question, “Why choose us”, is key to understanding an organisation and what it believes that its customers value. It is therefore key to planning for business agility. A more complete understanding of the organisation involves the elements shown below. Progressively refining our understanding of the organisation is the basis of our ‘Strategic Business Analysis’. 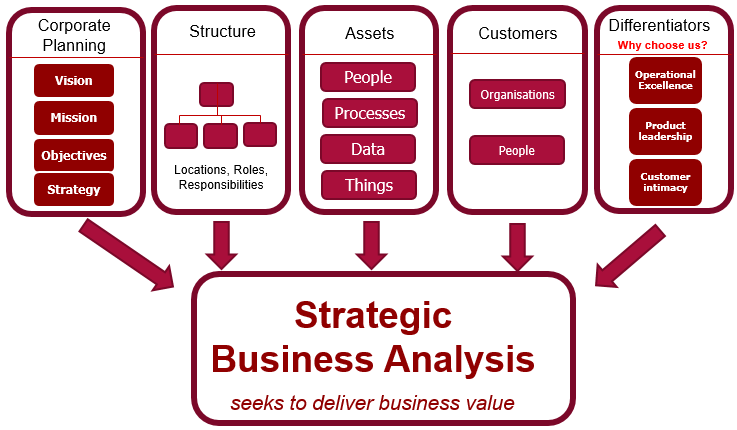 What is strategic business analysis? The business analysis centre of excellence is the nerve centre of strategic business analysis. 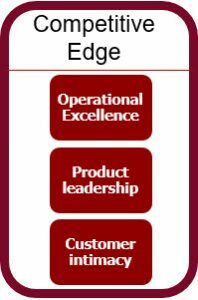 Its objectives are to ensure that the business analysis function has the capabilities, management practices, relationships, tools and techniques to help the organisation achieve greater business agility. Three areas directly related to business analysis capabilities and business agility are business processes, business data and business rules. The effectiveness of these ‘hard’ capabilities is directly dependent on each business analyst’s people skills.